A Criminally Creative Quintet at The Poisoned Pen! Once again, Denis had his nose slightly out of joint because he had to work while I amused myself at my favorite bookstore, The Poisoned Pen. I didn't blame him for having a sore schnoz because not only was I going to see Paige Shelton, Laura Bradford, Lynn Cahoon, and Chevy Stevens being hosted by Writer in Residence Linda Castillo, I was going to a nearby restaurant afterward with at least three of them. Poor Denis! 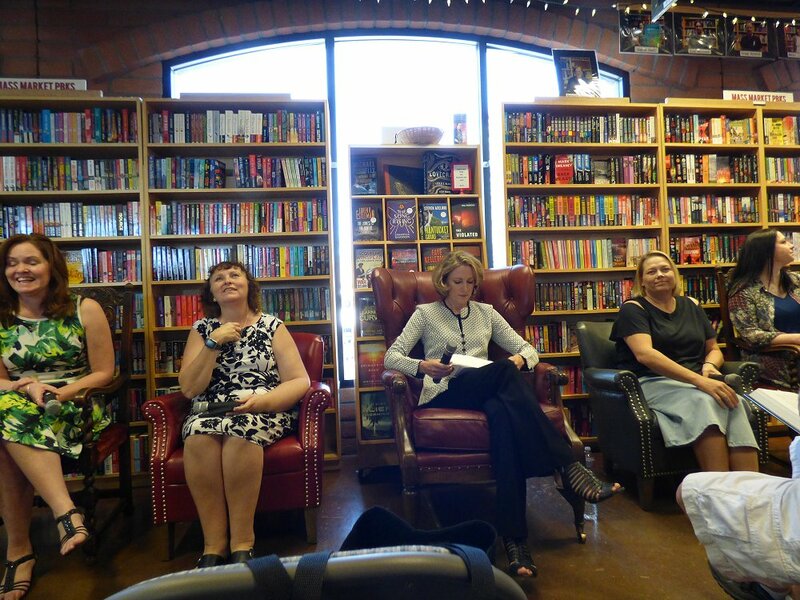 Linda Castillo began by introducing each of the authors and listing the series that they wrote. Chevy Stevens grew up on a ranch on Vancouver Island. She later became a realtor, and when she got the idea for Still Missing, she quit her job to write. She writes standalones of domestic suspense. Lynn Cahoon is from the St. Louis area. She's had several different jobs but currently deals with car licenses and titles. 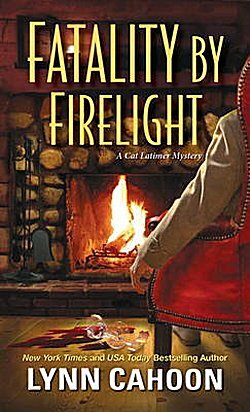 She writes series in the cozy mystery and romance genres, the two cozy series being her Cat Latimer and Tourist Trap books. 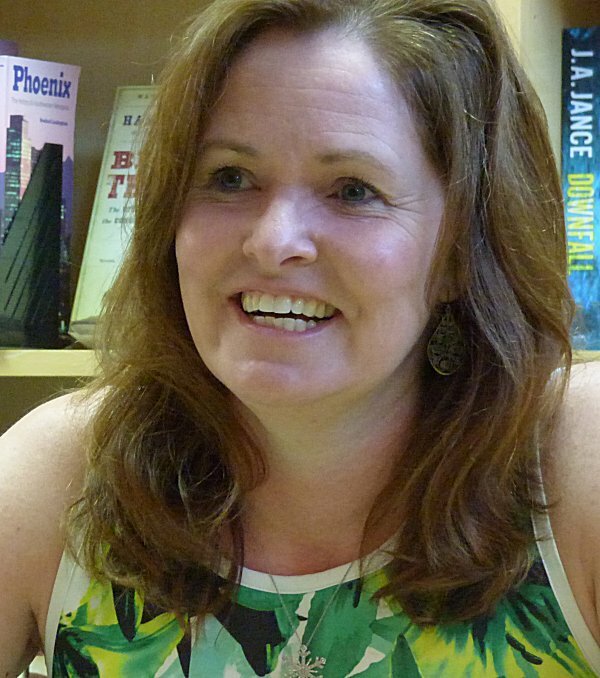 Paige Shelton lives in Gilbert, Arizona, and writes the Dangerous Type and the Scottish Bookshop series. 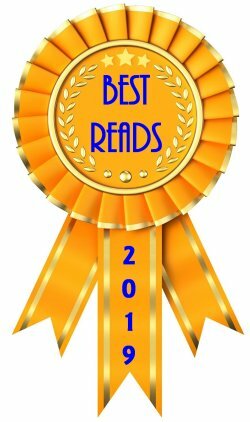 Laura Bradford lives in New York State and writes the Amish and the Emergency Dessert Squad mysteries, and the Southern Sewing Circle mysteries under the name Elizabeth Lynn Casey. She is also an advocate for those living with multiple sclerosis. Castillo then wanted to know about the authors' latest books. Chevy Stevens' Never Let You Go started out as a different book, which was thrown out after she'd worked on it for nine months. (Everyone agreed that it wasn't working.) Stevens had a father with a drinking problem and an ex-boyfriend who didn't take breaking up well-- once crawling through the dog door "to return some books." These experiences led to her current book, a standalone mystery about domestic abuse. 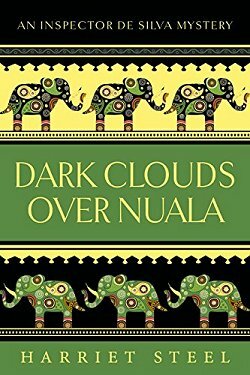 It's written from the point of view of the mother and daughter, ten years after the abuse took place. Lindsey made a new life for them both, but her ex-husband walks back into their lives, saying that he's changed. 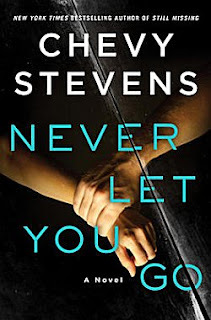 Readers know that he's no good before Lindsey does, and Chevy let us know that the first part of the book alternates between the present and the past. Castillo loved the book's setting as well as the shop that Clare Henry runs which specializes in typewriter and book repair. Paige Shelton spent over twenty years in Utah, and-- pre-husband and son-- she'd always meant to get gussied up and go to the Sundance Film Festival in Park City to see as many movie stars as she could. Unfortunately she never did. 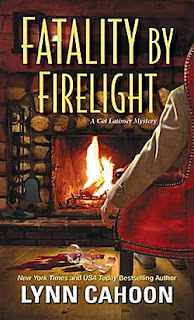 Lynn Cahoon's Fatality by Firelight is the second book in her Cat Latimer series set in a fictional town south of Denver, Colorado. Latimer has inherited a house and turned it into a writer's retreat, a setting that Castillo really liked. 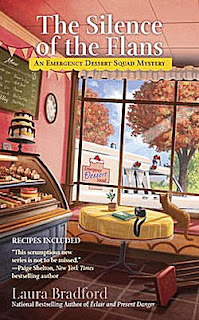 The Silence of the Flans is the second book in Laura Bradford's Emergency Dessert Squad series. She originally pitched the first book as "Dessert 911," but that title was thought to sound too much like a cookbook. Her editor then came back with Éclair and Present Danger, a spoof of a Tom Clancy title (A Clear and Present Danger). As you can see, this second book follows the same theme. Linda then asked the authors about their writing processes-- something she always wants to know when meeting other writers. Chevy Stevens signing a book for a fan. Chevy replied that "sometimes it's like trying to rein in wild ponies to get me to settle down to write." Now that she has a young daughter, she usually gets in a good four hours of writing a day, but "sometimes it takes me eight hours to get it." She used to write in a travel trailer on the property until her daughter started walking. Now she writes in a coffee shop every day. She knew she'd "arrived" when she got a head nod from the old guys who are regulars there. Paige told us that "I write at my desk on a desktop computer. I write on my laptop. I'm very mobile. I've now started outlining my books, which probably thrills my publisher. Yes, I'm pulling up my pants and becoming a plotter!" Lynn Cahoon said, "I write from 5 AM until 6 AM when I get ready to go to work. I write during my lunch breaks and at home after work. In all reality, I'm on Facebook in the morning and playing catch-up on my writing during work breaks and when I get home. After having a double hip replacement, I got my words in by noon and then 15,000 in a week! Then I had to go back to work...."
Linda asked her if she worked full-time, which Lynn does. "Do you need more hips?" Linda quipped and then said, "My hat is off to you!" 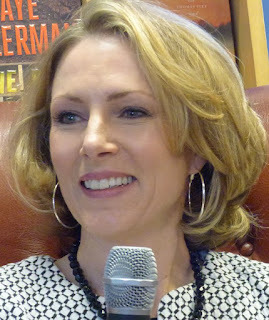 Laura Bradford said, "I try to write early in the morning. By the end of a book, I'm so into it that I will write all night." Then Castillo wanted to know about the research these women did. Chevy Stevens writes from personal experiences and has a friend who's a therapist and really understands how a story is written. She also has good police sources, telling us something that I've heard from other writers: retired police officers are the best because they really like to talk. Chevy now feels that she's "destroyed Canada" in her books, so her next book is set in Seattle, which means that she will need new contacts. Paige researched several things for her Dangerous Type mysteries: the Gutenberg printing press, typewriters, geology-- "a little of everything"-- except calico cats. She's had numerous fans contact her to tell her that extremely few calico cats are male (like the cat in Bookman Dead Style). Lynn Cahoon said, "I'm always worried that I won't get enough research done. Whenever I need more information about something, I mark an X in the manuscript where I need it so I won't fall down the Google rabbit hole. Then I go back and fill in the X's during the second go-round of the manuscript. 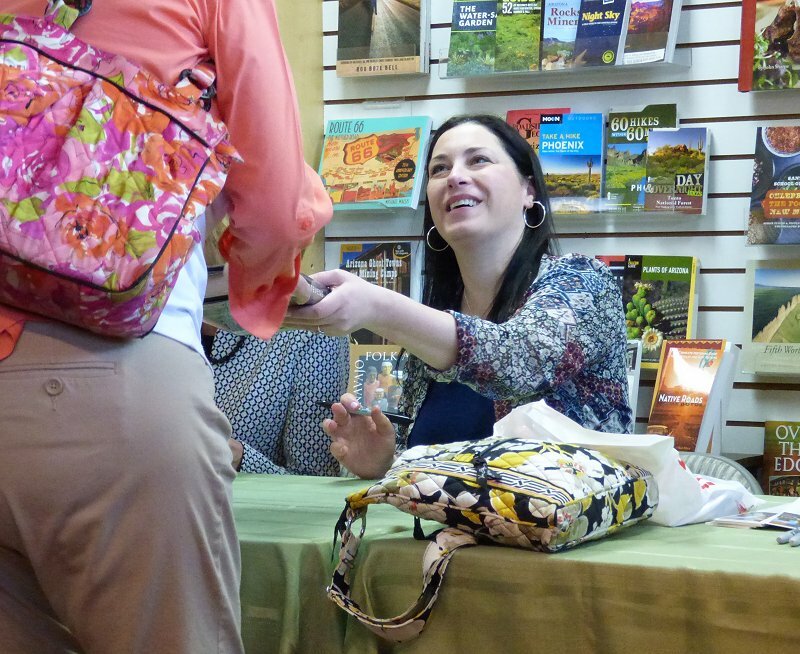 All the towns I write about are fictional so I can do whatever I want to with them!" Laura told us, "I'm a baker and an eater. Yes, I have made all the recipes in my books! The biggest area of research for me in The Silence of the Flans was the method of death. I also have to do a lot of research for my Amish mysteries." (Linda was nodding her head in complete agreement.) Laura, who lives in Westchester County, New York, also said, "I stay away from guns because I don't know much about them, and I also stay away from details about cars." All the authors agreed that guns and cars were two areas guaranteed to get the most complaints if something was written incorrectly. Linda then wanted to know what's next. Chevy said, "I had to let go of the idea of writing a book a year. Now I don't know when the next book will be finished because my daughter is slowing me down. Family comes first. I'm not pressuring myself and just letting an idea formulate in my mind. My editor is well aware of this. All I can say about my next book is that it's set in Seattle, and the female character's husband has a stalker, someone who's telling the woman, 'You don't deserve what you have, and I'm going to take it away from you.'" 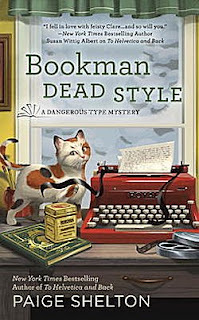 Paige said, "The next Dangerous Type book, Comic Sans Murder, will be released in December. The second Scottish Bookshop mystery, Of Books and Bagpipes, will be released next month. I have a title for my third Scottish Bookshop mystery-- Scalpels, Tomes, and Old Scottish Bones-- but I don't know if they'll let me keep it. 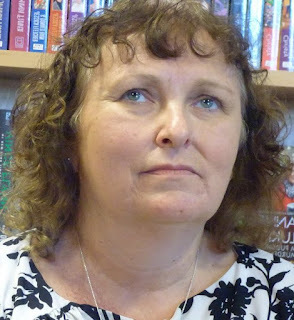 And I know that my fourth Scottish Bookshop mystery will be set in the Loch Ness area!" 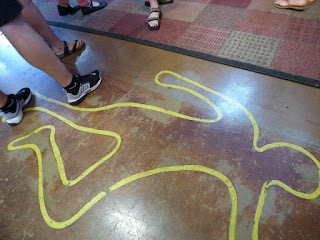 Lynn said, "The next Tourist Trap mystery, Hospitality and Homicide, will be released in May. Of Murder and Men is the next Cat Latimer which will be available in November, and I'm working on a new series called Farm to Fork which is set in Idaho." Laura Bradford's third Emergency Dessert Squad mystery will be out in January 2018, and it's called Dial M for Mousse. "There will also be new books in my Southern Sewing Circles series and my new Tobi Tobias series, but what I'm most excited about-- and can finally talk about-- is that I have a contract with Kensington Books for two Amish women's fiction novels. The first one will be released in the summer of 2018!" No mystery bookstore is complete without this! Then it was time for fan questions, and the first person wanted to know why these talented writers wrote multiple series. Laura Bradford: "I have multiple college tuitions." 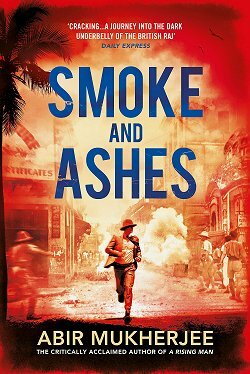 Lynn Cahoon: "It's all about my characters and getting to know who they are." Paige Shelton: "I work on multiple series in one day. For me, it's a matter of sanity!" Chevy Stevens: "I write standalones, but I do keep track of the different concepts as they occur to me." Lynn Cahoon: "I'm always thinking of different jobs I'd like to try. I want to do everything!" Laura Bradford: "I'd teach children about writing. I'd also love to have my own Dessert Squad." Paige Shelton: "I was in journalism and advertising, and I'd hide out in the bathroom, writing and trying to get published. If I weren't a writer, that's what I'd do now." Chevy Stevens: "I'd foster 600 puppies or bottlefeed tigers. Something like that!" Someone then asked Linda Castillo what her next book is. "Down a Dark Road will be released in July. It was a very difficult book to write. 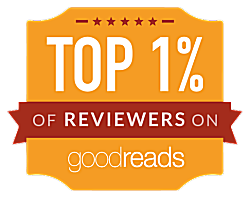 I was so afraid that I'd be late on my deadline, and when I turned it in, I wanted to hide because I thought it wasn't any good, but my editor said it was the best book in the series." Another fan made us all laugh by saying, "You all look like a bunch of church ladies. You don't look like people who hold so much murder inside!" Chevy quickly said, "I'm writing about what scares me, not about what I want to do!" which made Linda tell us that her husband has been asked if he sleeps with one eye open! The event then adjourned to the signing line and to the food table. 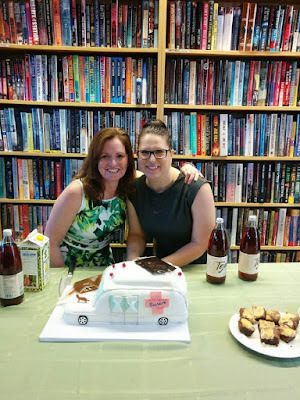 A very talented baker named Jen Sam created an Emergency Dessert Squad ambulance cake in honor of Laura Bradford's The Silence of the Flans. It was delicious! 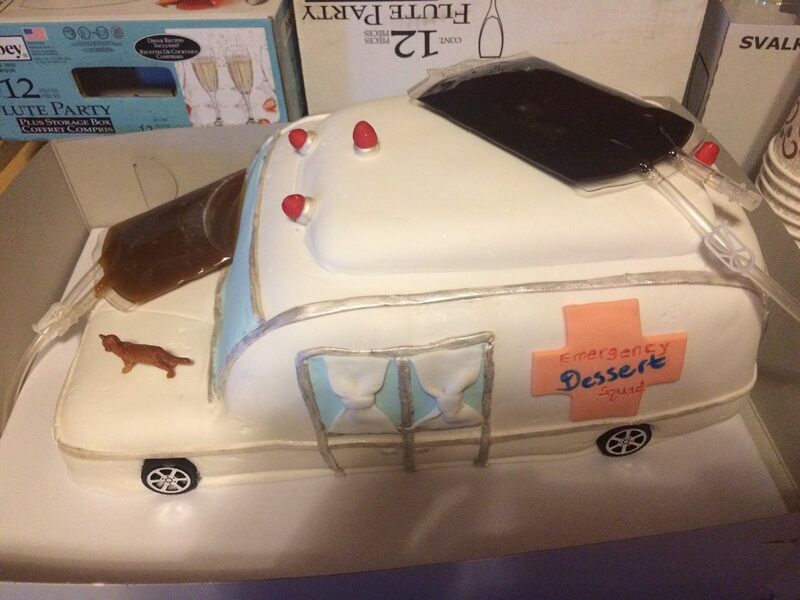 Jen Sam's Emergency Dessert Squad cake complete with chocolate-filled IV bags! 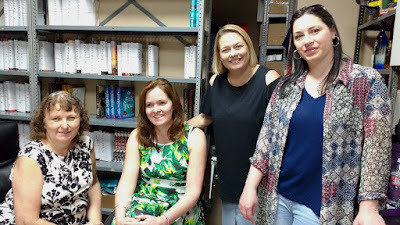 When all the books were signed and all the fans had their fill of cake, I had the privilege of going to a nearby restaurant with all five authors. I couldn't believe my luck! As we sat and ate our meals, talk and laughter flowed like a river. We joked and talked books and shared life experiences and funny anecdotes. I can't remember everything we talked about because I wasn't about to take notes. All I know is that it's a memory I shall always treasure. Paige, Laura, Linda, Lynn, and Chevy are wonderful, ultra-talented women, and I'm so happy to have been able to spend this time with them. You're welcome, Margot! They really enjoyed the opportunity to get together. It was so much fun. I really enjoyed meeting you! Wow, what a great event! And dinner too! What a way to end the day! I liked that they have so many collaborative questions. And the comment from someone that they don't look like they would be so murder-y! Yes, that comment made all of us laugh-- especially the authors! What a lot of fun that must have been -- and dinner, too. 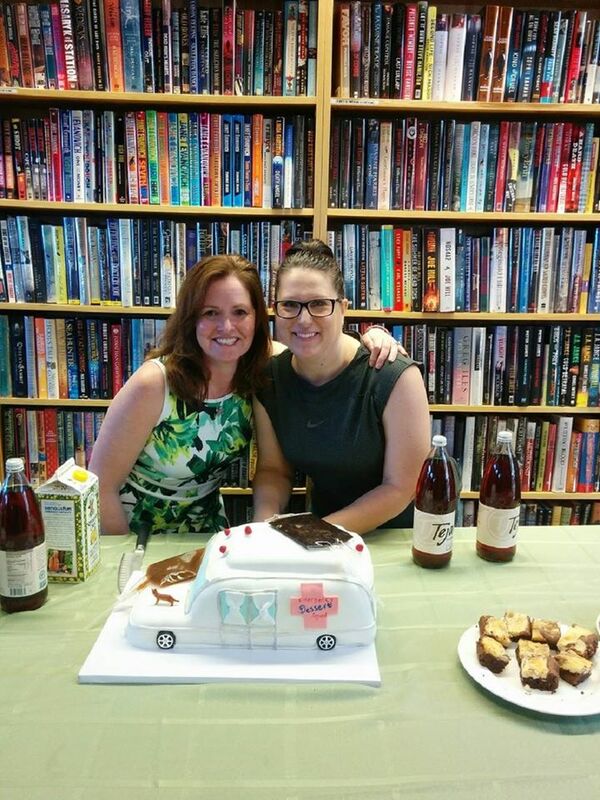 From this write-up, I almost feel as if I had been there -- except for the cake which looks delicious.